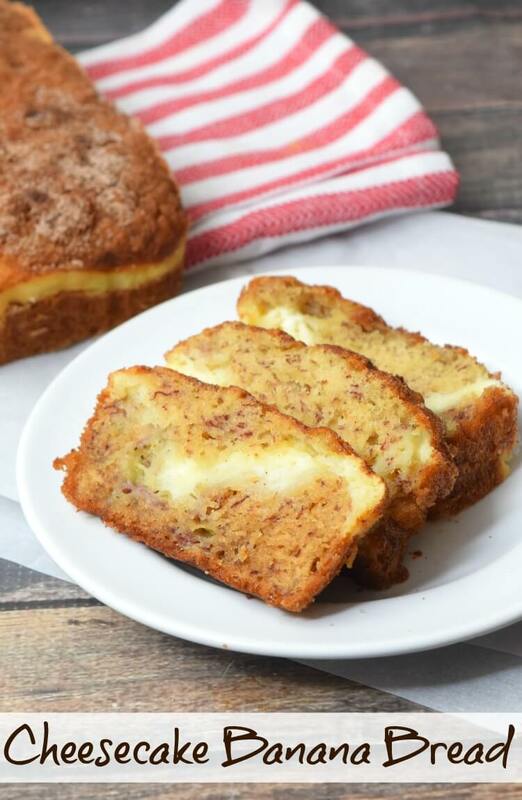 Cheesecake Banana Bread always reminds me of the holidays. It’s usually one of the first things I start baking to send out to friends and coworkers. I made a batch tonight with some bananas that were on their last legs. My husband loves taking homemade goodies to work like this. My family loves banana bread. I usually save the last of the bananas until they look like death and then make a batch. 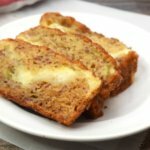 I have this old sour cream banana bread recipe that I use. I decided to change it up a bit to see what happens. It was an experiment to remember. I don’t know if this is just a local thing as Kroger stores are all over the country, but Kroger heavy cream is the thickest cream I’ve ever seen. When you compare any other cream to theirs, the other heavy creams look like milk. I love cooking with it in my mac n cheese to cakes and breads. 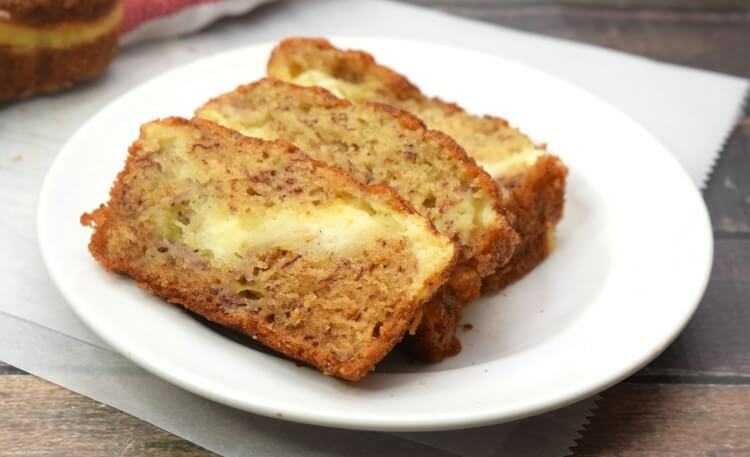 It just adds creaminess perfection that other cream doesn’t touch, and that is why I love using it in my baking like with this Cheesecake Banana Bread. With this particular recipe, I always can get 3 small loaves of banana bread. With how fast it’s eaten, I usually have to make a double or triple batch just to have any to send to work with my husband. I think my favorite part of this banana bread is the cinnamon and sugar topping. I put it right on the batter before putting it in the oven and it crystallizes into just the perfect topping for banana bread. 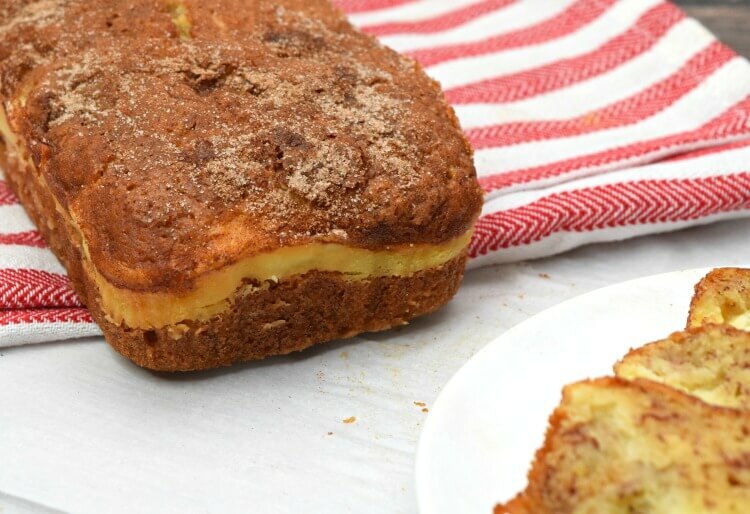 This Cheesecake Banana Bread has a wave of cheesecake in the middle and a sugar cinnamon topping that you’ll love. This will definitely become your favorite banana bread recipe. Mix sour cream, baking soda, and heavy cream. Cream together sugar, eggs, and butter. Add bananas, sour cream mixture, flour, and salt and combine. Mix the cream cheese, egg, sugar, heavy cream, and flour until well combined. Pour 1/2 the banana bread batter into 3 small loaf pans. Divide the cream cheese mixture between the 3 loaf pans. Then top each one with the remaining banana bread batter. Combine the sugar and cinnamon and sprinkle on top of each of the 3 loaf pans. You can totally turn this into muffins and bake for 24-28 minutes. If you like nuts, I recommend adding 1/2 cup of chopping walnuts or pecans. What is your absolute favorite thing to bake during the holidays? If you can’t tell, this is mine!